Although I've been attending fan conferences and literary festivals a good bit lately, it had been a while since I participated in a writer's conference. It was a great weekend, and if I inspired any yet-to-be-published writers, I can only say that I'm sure the attendees and the other writing professionals inspired me more! What a great and dedicated group. One of the high points of the weekend was the final event on Sunday afternoon, a tradition of this conference, the Query Gong Show. Everyone gathered in the main ballroom. A panel of agents attending the conference was seated on the dais, each with a gong, and a supersize gong was placed on the floor for other agents' use. Attendees had submitted anonymous query letters before the event. An MC (who did a great job) picked random query letters to read aloud, continuing until three of the agents had hit their gongs. Then the agents had to explain why they'd gonged--what was it about the letter that didn't work for them? It was a fascinating exercise. As you can see here, out of twenty-three letters, only ONE made it all the through the reading. It's been more than twenty years since I've submitted a query letter, but I do have to write a proposal for every novel, and the requisites are not so different. You have to encapsulate your story in just a few sentences, and you have to grab the reader from the first sentence or two. -Identify the type of book, as well as its length. -Identify the CONFLICT immediately. I can't say this loudly enough! -You would think it would be obvious, but be polite. -Set out your credentials clearly. -Don't tell the agent they will like the book--that's for them to decide. -Don't tell the agent what audience the book will appeal to--deciding that is their job, too. It might be partly because the focus of my talks for the weekend was plot, but I found that what really stood out for me was whether the query made it clear that the story was going somewhere, and was not just a portrait of a static moment in time. Query letters are brutal. I agree with everything you say, Debs -- AND then there's that je ne sais quoi... the VOICE of the writer that has to sound like a competent and compelling story teller without actually getting into very much detail about the book. There's always a mini-synopsis/pitch, and when it works it's magical. The mechanics are important, but getting that ONE paragraph right is a killa. "Don't threaten the agent." Does anyone else want to hear more about THAT?? ...just me, huh? It's hard to believe anyone with any sense would include insults or threats in a query letter. Duh. Do you think the "elevator pitch", that 30-second spiel one needs for face-to-face time with agents and editors, could be used in the same way? It's been a long, long time since I've written a query letter, probably close to 20 years. I'm not sure I'd enjoy getting gonged! I don't know if anyone followed the link to the letter that did get all the way through--and had two agents request the ms. But the writer did a pitch session, or sessions, and made changes to the original letter according to the agents' suggestions. You can see the difference. And the writer does sound like a competent story-teller. No wandering all over the place. All this made me think about how hard I worked when I first started writing to pare the plot of books I liked down to a few sentences, to help me understand how they were constructed--and how important an exercise that still is with my own books. Oh, the threatening letter. I don't remember verbatim, but something along the lines of, "If you don't take my book, you'll be sorry." I assume the writer meant it in the sense of "Because someone else will love it and it will sell more than James Patterson," but it got an immediate gong from almost every agent on the panel, and from the agents on the floor! BREAKING NEWS! THE WINNER OF TOM KAUFMAN'S ERASED IS MARIANNE IN MAINE! Marianne, email me your address at deb at deborahcrombie dot com and I'll forward to Tom. Debs, last year I had a similar experience. I sat with a nonfiction book editor and The Book Doctors-- http://www.thebookdoctors.com/ -- to judge the one-minute pitches of aspiring writers in Pitchapalooza. The winner was put with an agent and editor best suited for his/her book. They've done this all over the country, and many of their winners have gone on to get big contracts and have big hits. Like you, Debs, I was amazed at how many didn't give the most basic info up front--or at all. Lots of wandering around in words. and presumably these folks had worked over these pitches before bringing them in. My advice for pitches or queries is to put yourself in the agent's shoes. If you were someone who made your living selling writer's books to publishers and got a huge overload of queries all the time, what would you want to see in a query or hear in a pitch? What kind of book, who the protagonist is, VERY brief setup, CONFLICT, plus a good hint of writing style imbedded in the way you present the rest and a VERY brief bio. It's hard to do and takes a lot of revision and being tough with yourself, but the good ones just leap out at the recipient once they've done that work. Good reminders -- I'm moderating a First Impressions/First Page session at the Flathead River Writers Conference this fall. 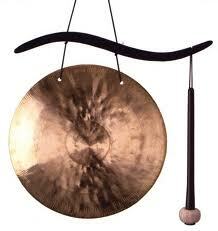 Hadn't thought about using a gong -- although we've got the very gong pictured hanging in our home! Gee, that Janet lady has a great smile. I know there are lots of books out there on how to write queries, but it was so interesting to actually SEE the agents' reactions. And I really appreciate this post as a digest of the Gong Show since by that time I think many of us were a bit wired LOL. I too was shocked at the lack of mystery or historical for that matter. Do you think yet-to-be published writers think that YA or fantasy is easier to write? Perhaps they think a "quest" plot is easier than planting red herrings in a mystery?